All too often, advice about container gardening seems to come in the form of some kind of “design challenge” in which container gardens are judged based on a photograph taken at a single point in time. This sort of thing has its place, but most of us aren’t planting containers to enter in the equivalent of a flower show exhibit. We’re planting them with the intention of beautifying some space for the entire growing season. Here in the North, that means June, July, August and hopefully beyond. That’s a different sort of challenge altogether. Okay, I’m exaggerating a little bit, but really—how many of us have the time and money to track down obscure plants from specialty growers? I’m not disparaging either one (plants or growers), but the majority of gardeners just don’t garden that way. They put together their containers using what they find at the nearest good nursery. It’s because of the shortcomings of the “design challenge” sort of articles and TV segments that have become so widespread that I recently created a new talk entitled “Containers that Won’t Quit.”* It’s all about how to plant containers that will look as good in September as they do in June using common, easy to procure materials. Take a look at the pair of photographs above left and below right, and you’ll see what I mean. ...and just as beautiful in September! For a container to look good all season long, its flowers can’t peter out in the heat of summer, and there has to be an easy way to keep its components in proportion as they grow. It goes without saying that the plants in the container have to remain healthy, so I place a premium on plants that are naturally disease resistant. 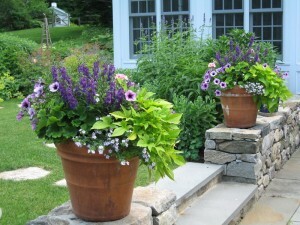 These requirements all lead to a particular approach to container gardening based on using a “short list” of the best plants, learning how to imagine at planting time how the container will look when it’s developed, following a few basic design tips, and performing some easy, routine maintenance to keep everything at its best. The containers in the photos above were planted for a client who once told me, “This will sound kind of boring, but I really just like petunias and geraniums.” So I planted the exceptional purple Supertunia ‘Bordeaux’ (one of the top two or three petunias you can buy, in my opinion) with pink geraniums, blue Bacopa, ‘Sweet Caroline’ sweet potato vine (Ipomoea), and a purple angelonia. The combination is simple, inexpensive, classic, and absolutely stunning all summer long. 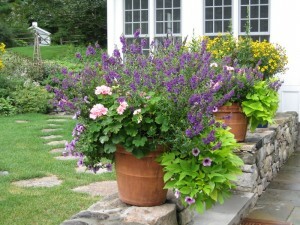 The only care it requires (above and beyond the obvious watering and fertilizing) is deadheading the geraniums weekly, cutting the petunias and the sweet potato vine back two or three times during the summer, and occasionally clipping out spent angelonia stems to encourage branching. That’s about as easy as a container gets. Consider the container pictured at left. It’s one of my favorites from the past few years. What’s in it? Certainly nothing exotic: coleus, impatiens and begonia. That’s it! What makes it work so well is using superior selections of these common plants. 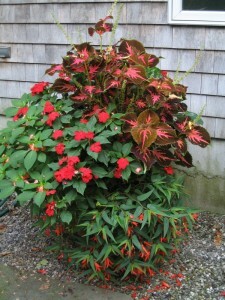 The coleus at the rear is ‘Kingswood Torch’, which grows into an impressive plant with just a couple hours of sunlight each day, as well as the Fusion series impatiens (‘Infrared’, in this case) interplanted with the old-fashioned, been-around-forever red Super Elfin Impatiens x walleriana from 6-packs, and ‘Bonfire’, a type of Begonia boliviensis that has made its way into the trade in the last few years. This begonia is quite disease resistant, has a graceful trailing habit, and (as you can see) is super-floriferous. Want to keep things even simpler? You can’t get any easier than a container with just one kind of plant. In sun, my first choice would be Calibrachoa (sometimes called by the common name “million bells”). These petunia relatives, with flowers that look like miniature versions of their cousins, are possibly the single best trailing flowering plants around. For hanging baskets, they’re unsurpassed. Combine a couple of them in complementary colors, and you’ve got a smashing container. Or, add a simple companion like Euphorbia ‘Diamond Frost’ (shown below with Calibrachoa ‘Crackling Fire’) for a little contrast. In shade, one of the very best plants capable of filling a container on its own and flowering all season long is Spathiphyllum, often called “peace lily.” You’ll usually find it in the greenhouse at your local nursery because it’s grown as a houseplant. 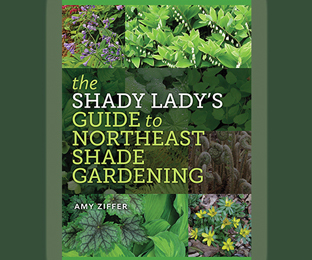 You’ll pay $25-30 for a good-sized specimen, but it’s a plant you’ll be able to overwinter easily (it’s just dirt simple to care for) and return to your shade containers outside year after year after year, so it’s a great long-term investment. I’ll be writing more about designing containers in future blog posts, but I’ll mention one important concept now: echoing color and shape. Of course, you’re free to plant a container that’s an absolute circus of colors and shapes if that’s what you want. But most people seem to agree that having some kind of relationship between the plants in a container is most satisfying to the eye. Two or more plants that feature similar colors or shapes in either their flowers or leaves harmonize, whereas totally dissimilar plants are much less likely to make an appealing combination. One caveat, though: you don’t want the plants to be too similar or the effect won’t be nearly as attractive. 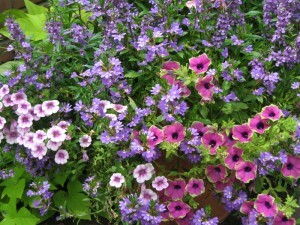 The combination of Calibrachoa Superbells ‘Tickled Pink’ and Petunia Supertunia ‘Pretty Much Picasso’ (along with purple Scaevola) shown at left illustrates both ideas. The flowers of both plants have a flared bell shape, while the light pink of one blends beautifully with the hot pink of the other even as the two remain distinct. Additionally, the chartreuse margin of the petunia flowers picks up the bright green leaves of ‘Sweet Caroline’ sweet potato vine at far left. 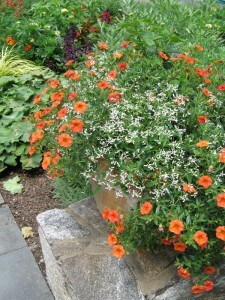 If you haven’t always been happy with your container gardens, consider my Containers that Won’t Quit approach. I’ll be writing more about it down the line, so don’t forget to subscribe. And if you’d like to have me give the full story about Containers that Won’t Quit to your garden club or other group, please drop me a line using this Contact form to let me know of your interest. Until then, may your winter be restful and restorative and a time to learn new ideas for the coming gardening season! Have you got a photograph of your own favorite Container that Won’t Quit combination? Be sure to label everything as fully as you can and describe why you like it so much. Then send it along and I’ll post it for other readers to see. * I just had the pleasure of debuting Containers that Won’t Quit for the Taconic Gardeners Club in Chappaqua, NY, and I’d like to thank the club for the opportunity. Before and after the talk I enjoyed chatting with several members about plants, containers, garden photography and more, and I can say that they’re a great group. If you’re located in the lower Hudson Valley, southwest Connecticut or even New York City, they’d love to have you as a member and I know you’d enjoy knowing them. Please take a look at their website and consider joining. Love the pots!!!! I live with little sunlight and gazillions of deer, so pots are my only “gardening”. I struggle with what to plant each year. I love to put pots not only on multiple walls, but also out in the yard at “surprise” places where no one expects to see flowers. Any suggestions you might have would be so appreciated. Your question is inspirational, and I’ll devote a whole post to this topic very soon.